It's misty and cool in Santa Rosa as Debriefer tries to puzzle out the dimensions of this ongoing drought. When will it end? Will it ever end? Debriefer needs to take a shower. "Bottom line: We're not out of the woods yet," says Brad Sherwood, program specialist for community and government affairs at the Sonoma County Water Agency. There are good signs, but too many springtime unknowns to declare this drought dead. "Rainfall looks good—rainfall averages are at 115 percent," says Sherwood, "and the reservoir levels have increased because of atmospheric river events. But the kicker to all this is the way the reservoirs are managed." The North Bay relies mainly on two reservoirs to fill its cups and quench its crops: Lake Mendocino and Lake Sonoma (pictured). Last week, the water agency reported that the former reservoir was at 98 percent of water-supply storage capacity, following recent rains. 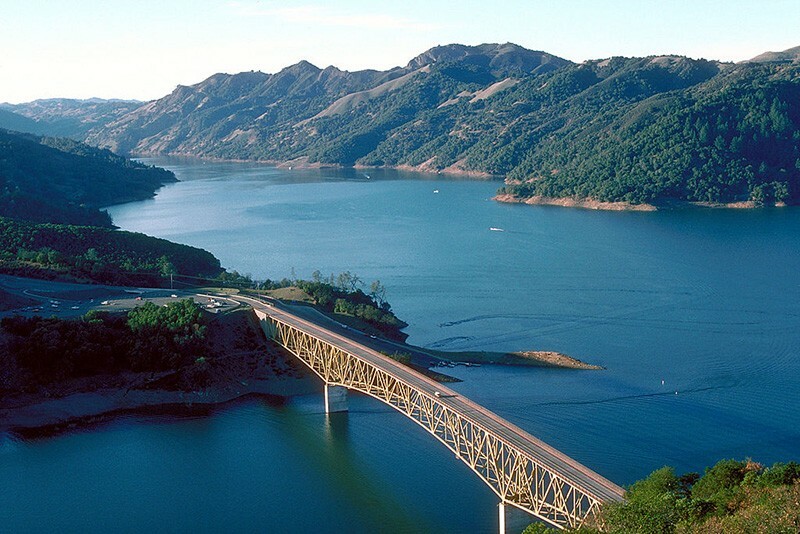 The larger Lake Sonoma is at 88 percent of water-supply capacity. The reservoirs, as Debriefer has explained before, operate on a layered system, like a cake. The water-supply pool is the lower part of the reservoir, and the county runs that show; the flood-control pool is above that—and if water levels get too high, the Army Corps of Engineers drains the surplus. Last time they did that, after a big storm filled the reservoir in late 2012, it was widely considered to be a stupid thing to do, given that the end of the drought was nowhere in sight at that point. This year the corps has agreed to let the county stash extra water for a non-rainy day—not as much as they'd like, but it's a start. "Normally, they'd be releasing any water that was in the flood control pool," says Sherwood, but the county will be able to "encroach" into the flood-control pool by 5,000-acre-feet of water. But there's a "scary proposition" out there based on what's already happened this year, says Sherwood: "January was very dry, and without that one system in February, we'd be in trouble. We're not ready to call off the drought just yet because we're waiting to see what happens in March and April in terms of rainstorms." What's Lake Mendocino going to look like, Sherwood wonders, if it doesn't rain again this winter? Could be down to 80 or even 70 percent of capacity. There are other issues complicating the picture, which Sherwood says should clear up by early April. As of next week, the county is obliged to open its spigots to fulfill state-managed "in-stream flow requirements," that assist out-migrating juvenile fish as they make their way down the Russian River and into the ocean. "Next week, the in-stream flow requirements will go back to what they normally are," he says. The good news is that there's "plenty of water [in the Russian River] for the out-migrating fish. You'd want to make sure that stays the same, so we don't have to release more water out of Lake Mendocino."